Ahmed, Sara. 2004. The Cultural Politics of Emotion. London: Routledge. Manderson, Desmond. 2013. Kangaroo Courts and The Rule of Law: The Legacy of Modernism. London: Routledge. Manderson, Desmond. 2012. 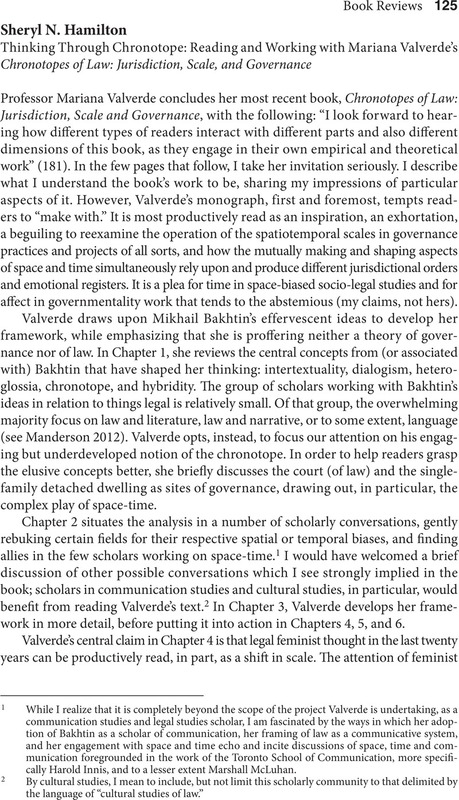 Mikhail Bakhtin and the Field of Law and Literature. Journal of Law, Culture and the Humanities 8: 1–22. Massumi, Brian. 2007. Potential Politics and the Primacy of Preemption. Theory and Event 10 (2): 1–21. Massumi, Brian. 2002. Parables for the Virtual: Movement, Affect, Sensation. Duke University Press. Schiffrin, Deborah. 1974. Handwork as Ceremony: The Case of the Handshake. Semiotica 12 (3): 189–202. Woodward, Kathleen. 2009. Statistical Panic: Cultural Politics and the Poetics of the Emotions. Durham, NC: Duke University Press. Haida Nation v. British Columbia (Ministers of Forests),  3 SCR 511. Manitoba Metis Federation Inc. v. Canada (Attorney General),  1 SCR 623. R. v. Marshall,  3 SCR 456.